Play as Legendary hero, Link, and explore a vast, dangerous world. Only you can protect Hyrule from the shadow that is slowly creeping across the land. Access the map and the item screens without interrupting gameplay or experience the adventure on the GamePad using off-screen mode. Enter the new Cave of Shadows using the Wolf Link amiibo figure. 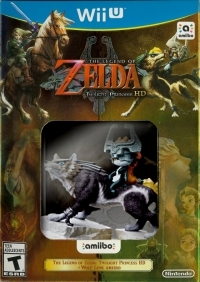 04-14-2016 mrfoxhound Box Text BECOME A LEGEND IN HD Play as Legendary hero, Link, and explore a vast, dangerous world. Only you can protect Hyrule from the shadow that is slowly creeping across the land. JOURNEY ACROSS HYRULE WITH THE WII U GAMEPAD CONTROLLER Access the map and the item screens without interrupting gameplay or experience the adventure on the GamePad using off-screen mode. Enter the new Cave of Shadows using the Wolf Link amiibo figure. 03-05-2016 aliensstudios Box Text BECOME A LEGEND IN HD Play as Legendary hero, Link, and explore a vast, dangerous world. Only you can protect Hyrule from the shadow that is slowly creeping across the land. 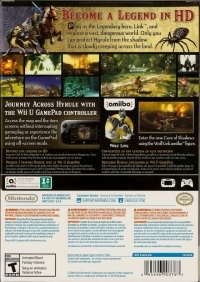 JOURNEY ACROSS HYRULE WITH THE WII U GAMEPAD CONTROLLER Access the map and the item screens without interrupting gameplay or experience the adventure on the GamePad using off-screen mode. Enter the new Cave of Shadows using the Wolf Link amiibo figure. This is a list of VGCollect users who have Legend of Zelda, The: Twilight Princess HD + Wolf Link amiibo in their Collection. This is a list of VGCollect users who have Legend of Zelda, The: Twilight Princess HD + Wolf Link amiibo in their Sell List. This is a list of VGCollect users who have Legend of Zelda, The: Twilight Princess HD + Wolf Link amiibo in their Wish List.